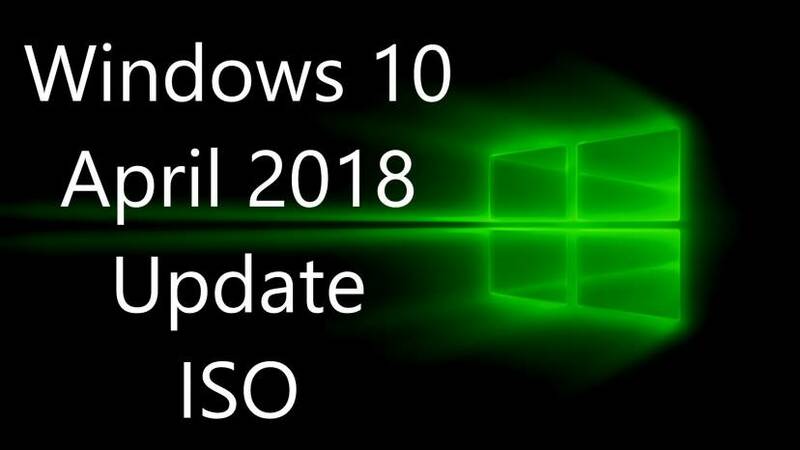 If you’re looking for official free Windows 10 Version 1803 ISO for fresh installation or recovery, you can now download it from the Microsoft’s official server. 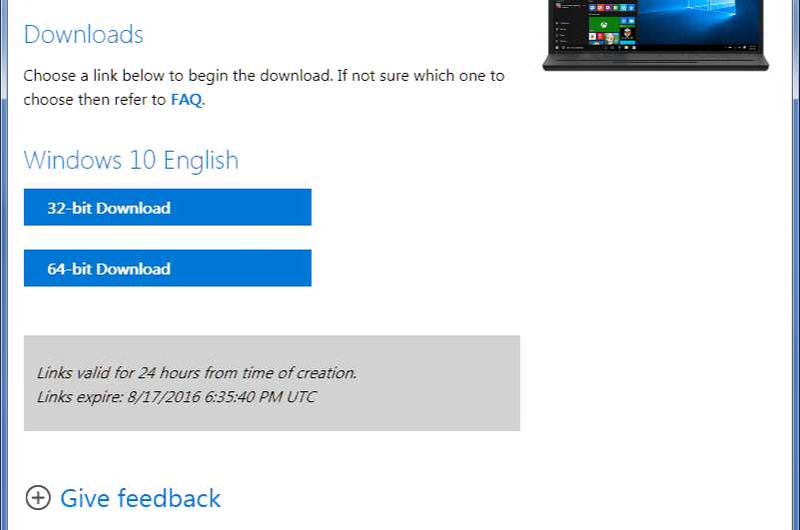 Currently, Microsoft is offering a direct link or Media Creation Tool (MCT) for ISO images. 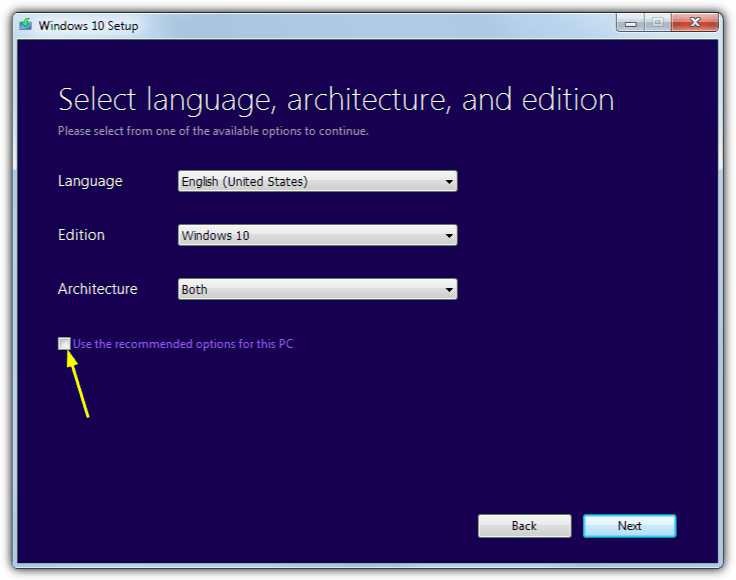 Microsoft’s Media Creation Tool allows users to download Windows setup files or ISO image accordingly to their preference. However, everything is done in the background, and you don’t have control over the download process. Also, you cannot use third-party download manager to pause and resume downloads. As a result, it could turn into a painful experience, if your internet connection is unreliable. 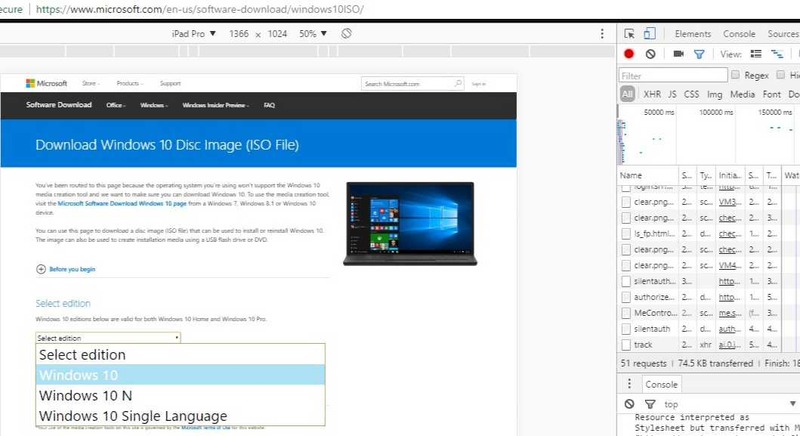 <1> First, to download Windows ISO images from Microsoft’s Tech Bench website. Copy and paste the below link in the Google Chrome. <2> However, the page will offer you Media Creation Tool download, which we don’t require. Now press the F12 key to enable Chrome Developer Tools and click on the small mobile phone icon to enable the Device Mode on. 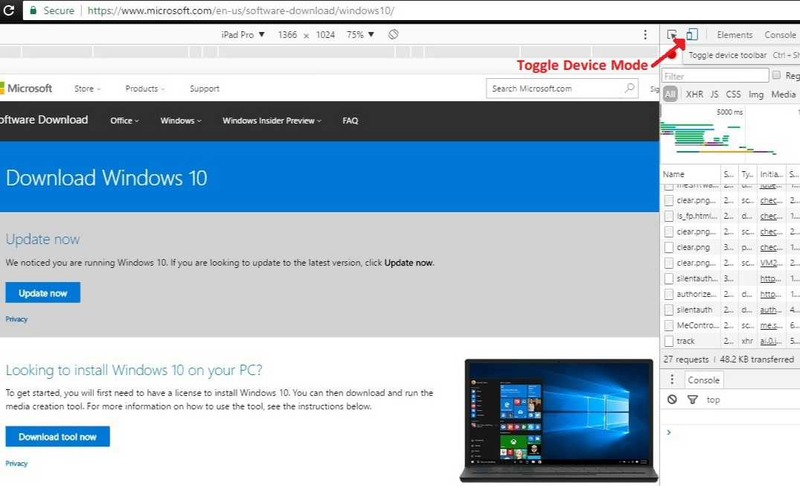 <3> Press F5 on your keyboard and now you see Official Download Windows 10 ISO page. <4> From here, select the Windows edition you want to download and click the ‘Confirm‘ button. Note – the official image contains both Windows 10 Home and Professional versions. You will get the option to select the edition when installing the OS. <5> Select the language and click the ‘Confirm‘ button. <6> From here, choose your desired Windows 10 in 32 bit or 64 bit edition and click download. The download will start and the link will remain active for 24 hours from the time of creation. Now you can create bootable USB stick or DVD for fresh installation. Check out our guide – how to create a Windows bootable USB/DVD drive with free Rufus software. You can also try the same workaround to download free Windows 10 April 2018 Update ISO (32-bit or 64-bit) (Windows 10 version 1803) images using Internet Explorer web browser. Press F12 key and click on Emulation tab and select “Windows Phone” from “Browser Profile” drop-down box. Now open the URL link and download the file. Note – You will require a product key to activate Windows. Download the Media Creation Tool and run it. Accept the license agreement and select “create installation media for another PC.” Now click Next. Now select the language, edition and architecture type. 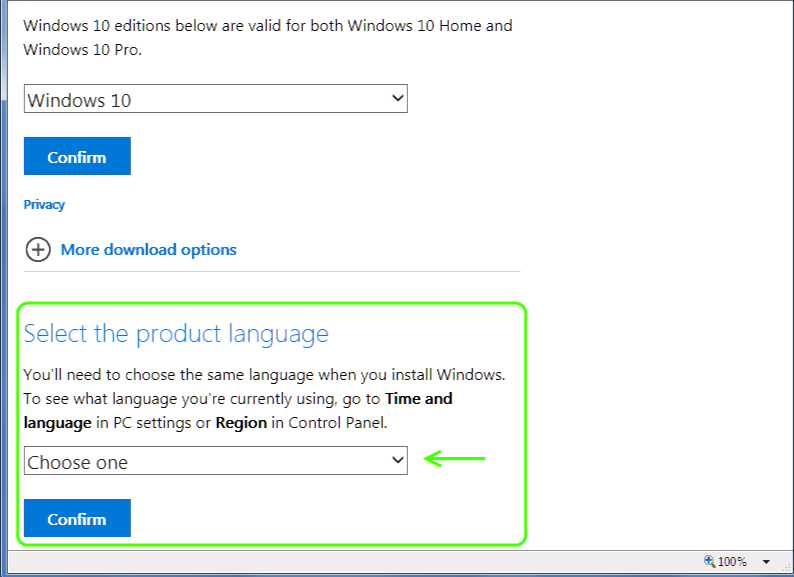 Note that the Windows 10 Edition includes both Home and Pro versions, so if you also choose Both in the Architecture menu you’ll get an all in one ISO image with 32-bit and 64-bit versions of Windows 10 Home and Pro on the disk. Click Next when done. Select “ISO file” to download and click Next. The file will then start to download. Now create a bootable disk and install Windows.